Inspired by 16th century Italian Renaissance architecture, the Pasadena City Hall is a stunning public building in the heart of Pasadena whose courtyard and rotunda provide a classic backdrop for wedding ceremonies. It was designed by John Bakewell & Arthur Brown and completed at the end of 1927, since becoming one of the city’s most iconic works of architecture and a favorite photography location for wedding couple portraits and engagement sessions alike. The setting is distinctly romantic, with lush landscaped gardens, ornate whitewashed architectural features and billowing fountains. You can exchange vows either in their spacious courtyard or rotunda, with access to the public blocked off during wedding ceremonies so you have complete privacy. The shade provided by the Pasadena City Hall means that you are protected from the harsh sunlight, no matter what time of day you hold your ceremony, while there are plenty of romantic locations to stage couple portraits or a first look session, incorporating the elegant columns and architectural features of the venue. Permits are required for weddings at the Pasadena City Hall, and you need to bring in your own chairs, decorations and sound equipment using outside vendors. All setup and breakdown of the ceremony space needs to be organized by the couple, making the services of a wedding planner highly recommended. Bookings can only be made 6 months prior to your wedding date, and as the venue is popular for multiple events, be sure to get in early! 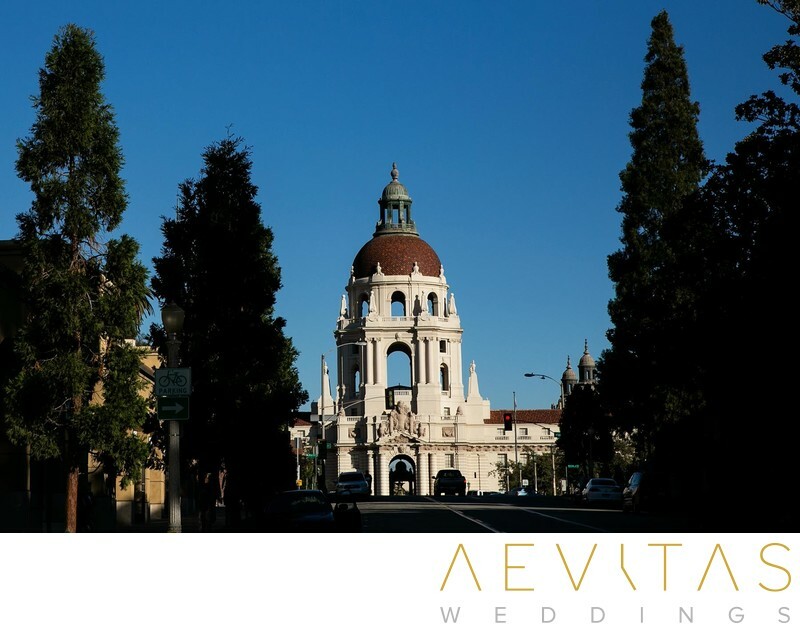 The Pasadena City Hall is located near plenty of upmarket hotels where you can get ready for your special day, as well as reception venues where you can celebrate your new union. Even if you don’t exchange vows and say your “I dos” here, the Pasadena City Hall is one of our favorite wedding day couple portrait locations. Its ornate, whitewashed backdrops and elegant features translate into stunning images for couples wanting a classic style to their wedding day photos.